Ms. Vĕra Jourová, Commissioner for Justice, Consumers and Gender Equality initiated in 2016 a regular dialogue with civil society and international organisations on the protection of children in migration with two meetings having taken place in 2016. 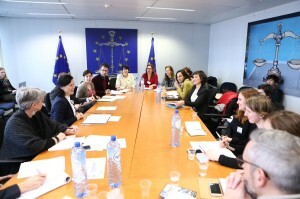 Coming up to one year after the 12 April 2017 European Commission’s Communication on the protection of children in migration, Commissioner Jourová welcomed on 26 February 2018 in Brussels another meeting with IOs, NGOs, ENOC and NIDOS for a very child-centered stocktaking of the situation on the ground. What has the Communication changed for children in practice? What are the actual outcomes for children and the challenges that still need to be addressed? Mr. David Lallemand, project manager and communications advisor at the Office of the Ombudsperson for Children’s Rights, Belgium (French community) took part in the meeting on behalf of ENOC. On this occasion, Mr. Lallemand had the opportunity to introduce the ENOC Athens recommendations from November 2017 related to social inclusion of children on the move and covered some specific aspects such as providing child-friendly information, age assessment procedures, access to education, legal aid and cross border cooperation. He also talked about the deterioration of the situation of migrant and refugee children and the grave risks encountered by unaccompanied migrant children since the closure of the Calais migrant camp also called the “jungle” despite the guarantees that have been provided by the French authorities to the four Commissioners for Children (from France, Belgium-French community, Belgium-Flanders and England) who have visited the camp prior to its imminent closure. From a more general perspective, ENOC joined the other participating organisations to back the recent statement of the UN Committee on the Rights of the Child (CRC) calling for EU-wide ban on child immigration detention while EU law still allows detention of migrant and refugee children, whether accompanied or not, “as a last resort”. It has been suggested, and Commissioner Jourová expressed a favorable view, that “last resort” detention is replaced by all other « non-coercive alternative measures » that are hardly ever applied while prove to give better results.